In the United States there are astronauts, in Russia there are cosmonauts, in China there are taikonauts, in India there are vyomanauts; in Africa, there would be an afronaut. Africa has a major role to play in the space arena and their past ambitions should not be forgotten. In 1964, Edward Makuka Nkoloso was a Zambia school teacher with a lot of ambitions for his country, freshly independent. He instigated a space program intended to send a 17 year old girl and two cats to the Moon as well as sending a crew of astronauts to Mars. Unfortunately, Nkoloso did not manage to acquire the £7 million funding that he sought and his space program was cancelled. Although his plans may have been too ambitious and his efforts have been ridiculed, it must be emphasized that this man dared to reach beyond the limits and restrictions of his resources and technology. Another African that dared to dream is Jean-Patrice Keka of the Democratic Republic of the Congo. In 2005 Keka initiated the program “Troposphere” which involved sending experimental rockets to a low altitude, around 36 km. The project was privately funded, however with the success of Troposphere II and Troposphere IV the government decided to support the program. In 2008 Troposphere V was launched with an intention of carrying a rat onboard the top section of the rocket to 36 km altitude in 95 seconds. The attempt was unfortunately not successful: the rocket crashed and the rat did not survive. Algeria, Egypt, Morocco, Nigeria, and South Africa are the only African countries which have currently developed a space program — the most advanced being Nigeria and South Africa. Ghana developed a space office in 2012 and expects to evolve it into a space agency in 2016. Although Africa has not managed to send any humans to space with indigenous capabilities, so far there are two people who have been to space and one planned to go to space who were born in Africa. 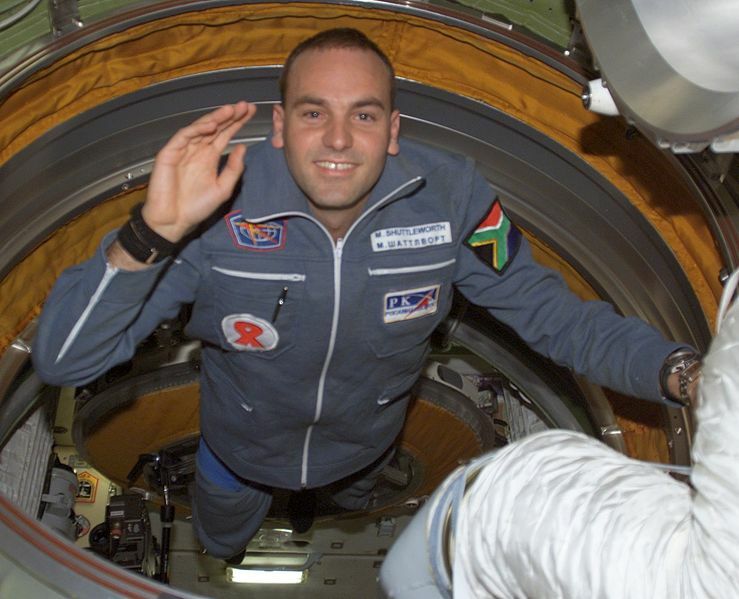 Mark Shuttleworth aboard the International Space Station (Credits: NASA). Patrick Baudry is an astronaut of Centre National D’Études Spatiales (French Space Agency). He was born in Douala in Cameroun which is in the center of Africa. Baudry flew on NASA mission STS-51-G on Space Shuttle Discovery in 1985. Mark Shuttleworth is a British-South African entrepreneur who became the second space tourist. In 2002, he flew onboard a Russian Soyuz mission and spent 8 days onboard the International Space Station (ISS). The journey cost him almost 20 million US dollars and required a year of training, mainly at Star City in Russia. Whilst on board the ISS he was involved in experiments researching AIDS, a disease which is thought to have originated in Africa and still affects many Africans. Finally, Mandla Maseko is an engineering student from Mabopane, South Africa. He is one of the winners of the global Axe Apollo competition. If he successfully passes his medical tests, in 2015 he will fly onboard the Lynx Mark II. Two of these Africans have already found their way to space, but Africa does not yet have an afronaut, a person who was raised, educated, and trained for spaceflight in Africa. An African collaboration is probably the most effective method to achieve indigenous capability to send afronauts to space. However, politically an African Space Agency is not expected to develop in the near future. The difference in issues and interests across African countries demonstrates their different visions for the development and usage of space technology. Space applications which could help increase the quality of life of their people are more appealing than human space flight to many African countries. These differences are some of the reasons that inhibit the generation of a common space agency. The two major space fairing nations in Africa are Nigeria and South Africa, who are burgeoning and seem becoming dominants space player in Africa. 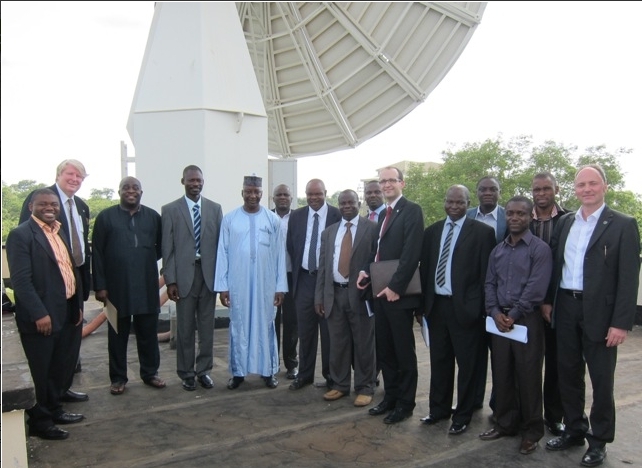 UN technical committee visits Nigeria’s satellite ground control facilities (Credits: United Nations). The Nigerian Space Agency NASRDA announced in 2013 that it plans to train one astronaut by 2015. The Director General of the agency, Dr. Seidu Mohammed, declared “the possibility of this has been demonstrated by a lot of research done in the past and we have decided that by 2015, a Nigerian can go to the space and conduct research at the highest level.” This is part of a 25 year program of the development of Nigerian space and technology. The program is supported by substantial political backing and includes the planning and designing of satellites and space research to analyze issues of interest to Nigeria. Unlike Nigeria, South Africa has not demonstrated intention to venture into human space flight. SANSA, the South African National Space Agency, focuses its effort on remote sensing to monitor and control disasters and natural resources. Education, infrastructure, and scientific programs are the keystones of a space program. Africa is currently developing these areas. The emergence of an African scientific leader who generates public interest in space exploration would foster a safe and sustainable space program. The development of human space flight would benefit both national and African pride and we are expecting amazing achievements in the near future. Mike Melville is also a good example of someone who may deserve the title of Afronaut. However, there is still an ongoing debate about whether persons involved in commercial suborbital spaceflight are classified as astronauts.